Thin wall tubing is becoming increasingly used in various industries which require precise measurements including: medical, for applications such as catheter systems, lab equipment, and surgical instruments and diagnostic equipment; industrial manufacturing, for chemical and solvent processing; automotive, for fuel lines, bundling, color coding and wire harnessing and other engine and fuel processes. Thin Wall Tubing – STAM, Inc. The thickness of the wall does not affect the outside diameter (OD), although it does affect the inner diameter (ID), which is calculated as OD minus two times the wall thickness. Thin wall tubing can be fabricated from metals such as stainless steel, aluminum, steel, copper and brass, as well as plastics including polyvinyl chloride (PVC), Teflon, nylon and polyethylene terephthalate (PET). Some advantages of thin wall tubing include good insulating properties, excellent abrasion and chemical resistance, high strain relief, high temperature capabilities and protection against mechanical damage. In addition, certain types of thin wall tubing are up to military (MIL) standards and may be used in corresponding applications such as military vehicle harnessing. Some thin wall tubes may also be flexible allowing for increased application usage not limited to range of movement. Two different processes are used in thin wall tubing manufacturing: tube rolling and tube extrusion. Tube rolling involves three main steps: cutting pre-impregnated materials and rolling them around a mold or mandrel; wrapping the mandrel in a sleeve or film to eliminate retained air; and heat-curing, after which the mandrel can be removed to release the formed hollow tube. In tube rolling, to make thin-walled tubing, the pre-impregnated materials must be wrapped incredibly tightly around the mold. Of all the tube rolling mill types, Assel mills are the best-suited for high precision in tubing wall thicknesses. However, tube extrusion is a much more common process. In order to begin extrusion, a round billet is pressed by a ram through a die, which is a hollow profile that shapes the material into the desired shape as the billet is squeezed through. This process is performed at extremely high temperatures. The material can be extruded through the die using two different methods of extrusion: indirect extrusion and direct extrusion. In direct extrusion, the die is held stationary while the ram pushes the billet through the die opening. In indirect extrusion, the die is held stationary as the hollow ram moves into the stationary billet from one end, forcing the material to flow through the die. 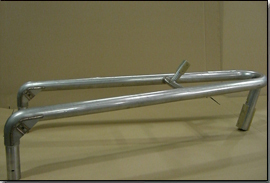 After the thin-wall tubing has been extruded, it is straightened by a stretcher into the desired length. There are a number of steps in tube fabricating and tube cutting and each needs to be considered carefully. Thin Wall Tubing Thin wall tubing is precision tubing that typically ranges from .001 in. (.0254 mm) to about .065 in. (1.65 mm).